Did you know that the current ninth chapter of JTTW did not appear in the original version anonymously published in 1592? Those who have read the novel may recall that it details the tragedy surrounding Xuanzang’s birth, namely the murder of his father and the kidnapping of his mother, years prior to him becoming a monk. This narrative first appeared in a slightly later version of the novel titled The Chronicle of Deliverances in Tripitaka Tang’s Journey to the West (唐三藏西游释尼傳) compiled by Zhu Dingchen (朱鼎臣) of Canton in 1595 (Wu & Yu, 2012, p. 18). Fig. 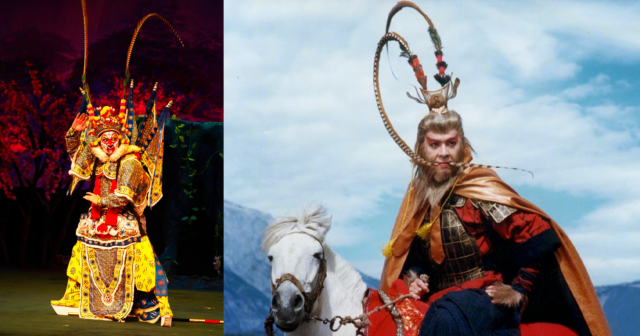 1 – (Left) Monkey as portrayed in Beijing Opera (larger version). Fig. 2 – (Right) Sun Wukong angrily biting one of his cap feathers. From a live action adaptation of JTTW (larger version). The third chapter of JTTW describes how, in addition to his magical staff, Monkey receives a phoenix feather cap, a set of golden chainmail armor, and cloud-treading boots from the undersea dragon kingdom. The armor and phoenix cap are highly recognizable elements of Sun’s iconography. I suggest this attire was directly influenced by that worn in Chinese opera, an artistic medium that presented popular events from the JTTW story cycle long before the novel was published. 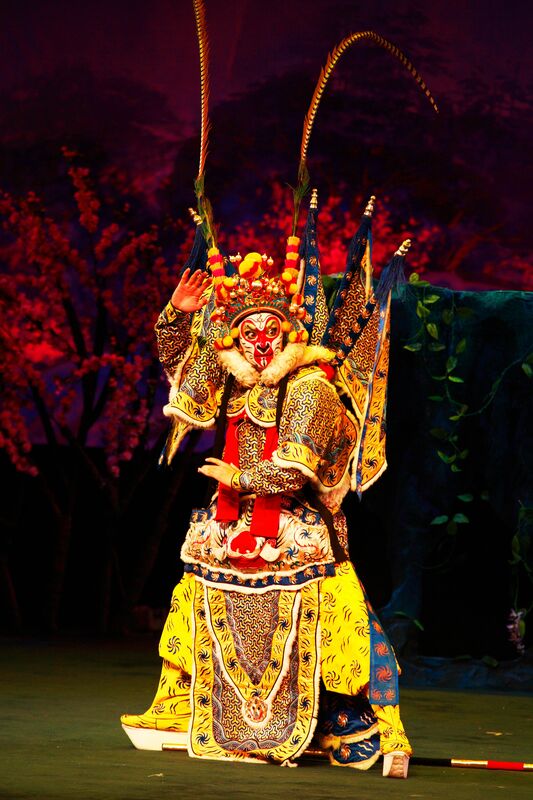 In Beijing opera, for example, Monkey is often portrayed as a Wusheng (武生), a heroic role focused on martial combat and acrobatics. 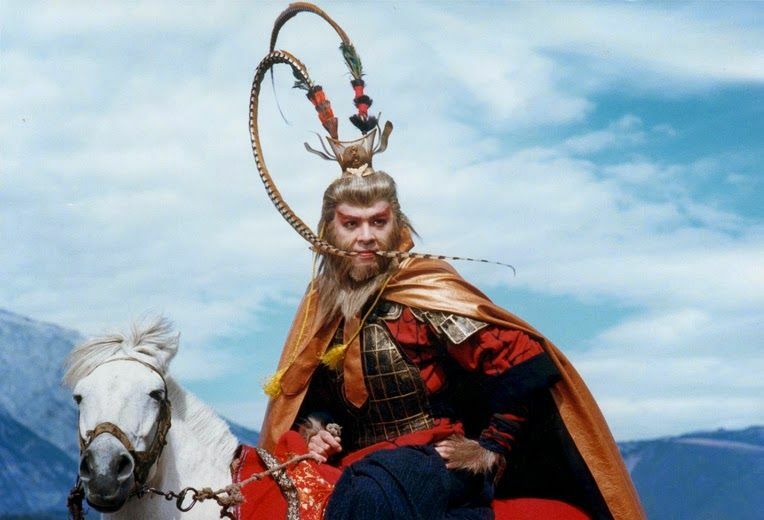 Regarding the costume, Bonds (2008) explains, “The Wuxiaosheng [武小生, a variant of the Wusheng role] generally wear kao [armor (靠)], high-soled boots, and often have [six-foot] long feathers (Lingzi [领子]) attached to their silver or gold filigree helmets” (p. 3) (fig. 1). She goes on to say, “[F]eather movements enlarge the gestures and emotions of the wearer. For example, rotating the head in circles…expands a sense of anger. Shaking the head back and forth quickly…adds to extreme frustration. Biting crossed feathers in the mouth heightens the appearance of aggressive feelings” (p. 44). This feather biting can be seen in numerous live-action adaptations of JTTW (fig. 2). So by referencing such attire, the author/compiler of JTTW was not only providing a mythical origin for the armor worn by the character in operatic stage plays, but they were also highlighting Monkey’s status as a great hero. Wu, C., & Yu, A. C. (2012). The journey to the West: Volume I. Chicago, Illinois : University of Chicago Press.